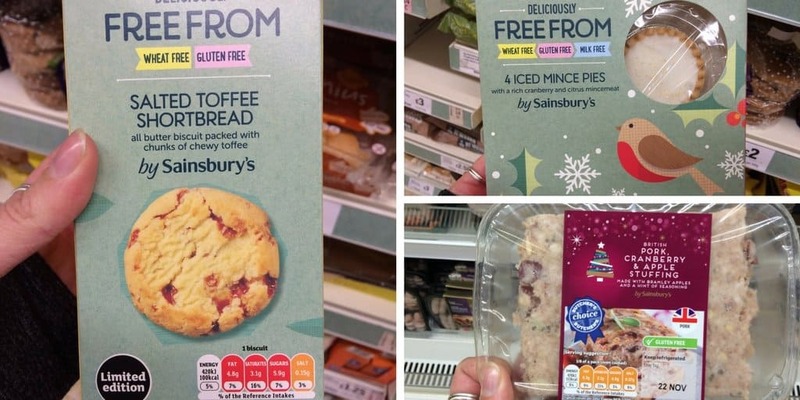 Following on from my first Free From Christmas instalment with my gluten and dairy free finds in Tesco, I can now bring you part two – my gluten and dairy free Christmas finds in Sainsbury’s! Tesco was always going to be a hard one to beat, as it has launched SO many new Free From products in its festive range. Sainsbury’s has a smaller range but I was once again particularly impressed with its range of stuffing and sausage-based foods. Needless to say, I have already bought and demolished some of the pigs in blankets and they were lush! From what I can see, all of the stuffing and Taste the Difference sausage ranges are gluten free, which is great news. These look really cute and would be great on the dinner table on Christmas day. Pork, sage and onion is a classic combo, and they come in packs of 12 or 20. I’ve really become a fan of fruit in savoury foods this year, when I always used to hate it! This gluten free pork, cranberry and apple stuffing sounded really interesting. Chestnuts are a staple Christmas food so pork and chestnut stuffing sounds delicious. I’m really torn between which stuffing to have this year – I might have to have a combination! Confession: I actually ate this pack about an hour before writing this post! They were so tasty – perfect on the dinner table, or my favourite is on cocktail sticks as part of a party platter! They also had chipolatas wrapped in bacon too, but these would be my sausage side of choice. I’m lucky enough to be able to eat nuts but for those who can’t, finding a Christmas pudding must be a nightmare! Enter this bad boy – perfect for anyone who suffers a range of intolerances or allergies, and big enough to share… if you want to! Can we please take a moment to look at HOW CUTE these gluten free mince pies are with their gold glittery coating!? I absolutely love this sparkly twist to these classics this year, and think they would look amazing as part of a buffet or left out for Santa. I bought these when they appeared on the shelves last month and they are really tasty. They are gluten and wheat free and an interesting idea for flavour which I haven’t seen anywhere else. Have you found anything else? What are you most excited to try this Christmas? Will you be waiting to try any festive treats or are you stocking up already? Comment below and let me know or share them on my Facebook, Twitter or Instagram pages. If you liked this post, make sure you check out my Free From Christmas guide to Tesco too, and I’ll be working through some other supermarkets too! Those Salted Toffee Shortbread are amazing! So tasty and moreish!